I made this movie to visually demonstrate the dramatic decrease in Arctic sea ice happening right now. 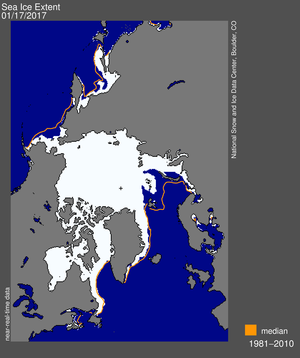 When I was born, in 1979, the minimum summer sea ice extent in the Arctic was about 17,000 cubic kilometers. In 2012, it was less than 5,000 cubic kilometers. The red points show weekly estimates of sea ice volume in the Arctic through time, from 1979 to today. The scale is from 0 to 35,000 cubic kilometers. There is a seasonal expansion of the ice during winter and a shrinking during the summer. There is no evidence for a sea-ice free summer in the past 700,000 years of Earth history. The next one is predicted to take place in the next 5-30 years. Sea ice volume estimates by PIOMAS show a long-term decline in sea ice volume in the Arctic. The summer sea ice minimum now contains only 20–30% of the ice volume observed in the last 1970’s. This phenomenon has been termed the “Arctic Sea Ice Death Spiral” and is directly related to anthropogenic greenhouse warming of the atmosphere. It is possible that the Arctic has reached an irreversible “tipping point” from which it cannot recover the lost ice. Credits: Music is Chopin’s “Funeral March”. Background image is the International Bathymetric Chart of the Arctic Ocean. Ice volume estimates from the Pan-Arctic Ice Ocean Modeling and Assimilation System. Animation produced by R. Eric Collins (UAF) using Open Source Software: code to reproduce plots is available at github, plots were animated using avidemux.